Japan Airlines was established in 1951 as Japan Airlines Co., Ltd.
JAL strives to provide its customers with high quality service to provide the ultimate travel experience inspired by the spirit of omotenashi. First Class: JAL offers its JAL Suites for its international First Class flyers. Customers are seated in a relaxing compartment with a wider bed than all other classes. First Class JAL Suite bed have a maximum length of 199 cm and width of 84 cm. JAL uses "airweave bedding" to ensure the utmost comfort during your sleep. Also in your compartment is a 23 inch personal television screen. The previously 19 inch screen has been expanded to provide a greater entertainment experience. Within your compartment and under your seat is enough storage to keep all your belongings close and at convenience. Business Class: JAL offers its Business Class flyers with ample privacy and legroom. Some models offer seating in a compartmentalized space and others not, but all business class seats fully recline to a flat bed. 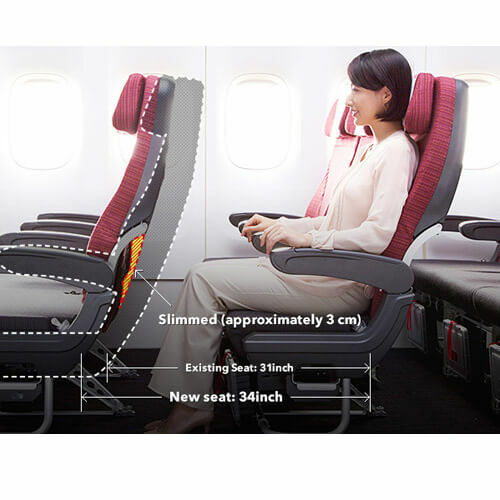 Business Class seats have an approximate seat width of 52 cm and a maximum bed length of 188 cm. 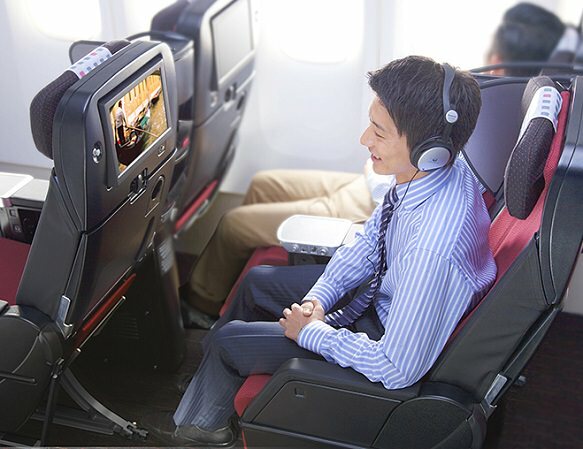 JAL's Business Class seats were named "Best Business Class Airline Seat" at SKYTRAX's 2013 World Airline Awards. Premium Economy Class: JAL offers Premium Economy seats on some of its models. Premium Economy seats offer a bit more leg space and wider seats than Economy Class seats. The seat pitch, which is the distance from the back of one seat to the back of the seat in front, is approximately 20 cm greater than the Economy Class seats. The personal monitors in front of each seat except the front row is also larger than Economy Class, stretching from a 10.6 to 12.1 inch screen. Economy Class: JAL strives to provide its Economy Class customers a comfortable travel experience. Many models of JAL have incorporated a 8-seat per row layout rather than the traditional 9-seat per row which gives flyers an additional 5 cm of space. Some models also offer wider seats by approximately 1.7 cm. All seats come with pouches attached to the seat in front of you to keep all your personal belongings close. Besides comfort, the quality of in-flight services and entertainment also affect your traveling experience. JAL strives to offer its customers with the best service possible. For its Economy and Premium Economy Class customers, JAL offers its "JAL-Class Creative Gourmet". With this concept JAL presents its customers with Japan's regional foods. Besides the customary meal served on board, Economy and Premium Class customers also have a few other dining options. Collaboration meals in which popular restaurants in Japan collaborate with JAL and create special meals for its customers are very popular. Past collaborations include the ORENO Corporation Restaurant famous for its affordable yet delicious Japanese French and Italian restaurant as well as popular Hawaiian origin KUA`AINA hamburger shop. Air Series Meals are also unique meal options offered by JAL. 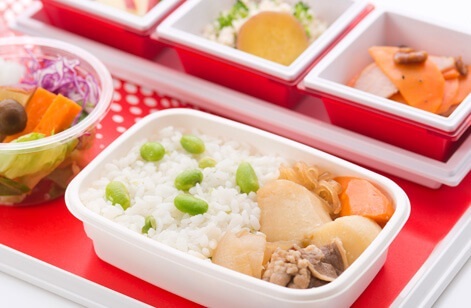 JAL collaborates with well known popular food chains to bring the tasty food on-board. Past collaborations for the Air Series Meals include famous food chains such as Kentucky Fried Chicken, Mos Burger, and Yoshinoya. Customers on Premium Economy have a few more options to choose from to add to their dining experience. Whether you want to sip on some champagne during your meal or enjoy a delicious soft Tononama donut from Nagoya, be sure to check out the menu for more choices. A very popular choice among customers is the "de sky" noodle series. "de sky" series are cup noodles created under a collaboration with Nisshin that are even available for sale at airports due to high demand. For its First and Business Class customers, JAL offers cuisines from its "exclusive restaurant in the sky" JAL BEDD. By gathering a group of highly talented chefs from Japan who have extensive knowledge and skill, JAL offers its customers with delicious meals. Fresh ingredients are prepared and presented in a beautiful manner providing its guests with a great dining experience. An extensive list of beverages is also available throughout the flight. Meal choices for your flight can be checked on the official website.